You don’t need LGA or JFK to embark on a journey for a taste of the south. 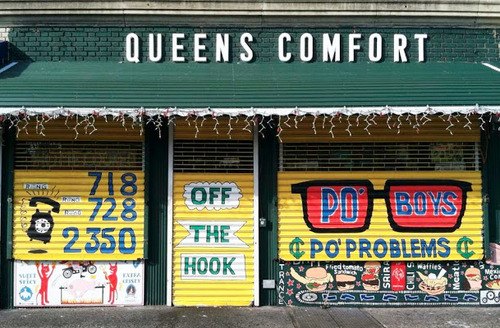 Queens Comfort, located just east of Steinway on 30th Avenue in Astoria, offers a variety of southern and southern-accented dishes on three dynamic lunch, dinner, and weekend brunch menus. 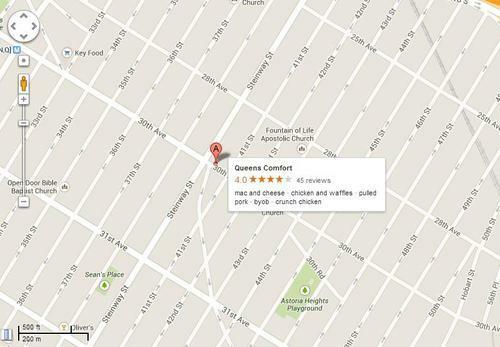 My most recent visit, however, wasn’t for the Po’ Boys or the grits – it was for the pancakes. Fortunately, I was able to pay a visit to Queens Comfort just as they were getting ready to make the seasonal switch in their pancake rotation. 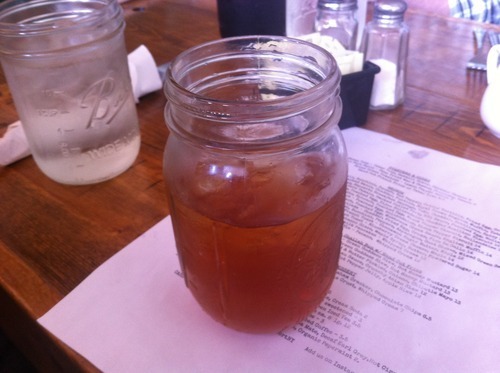 And what ingredient could at once epitomize long summer days and romanticize the south better than the peach? 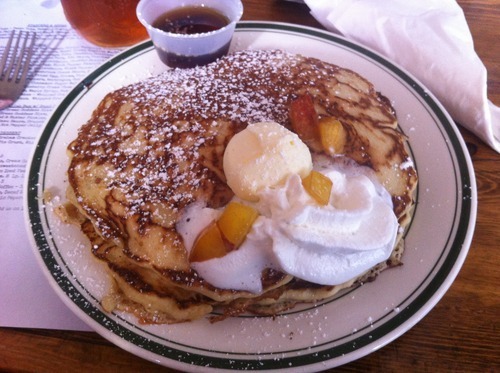 The fresh peach buttermilk pancakes are served two high and stretch to approximately 6 inches in diameter. Although cooked evenly throughout, these flapjacks were standard fare in the pancake universe. However, the inherent dryness of the pancakes was easily cured with fresh whipped cream, butter, confectioner’s sugar, maple syrup, and, of course, peaches. What really made these pancakes unique was that the peaches were not mixed into the batter. 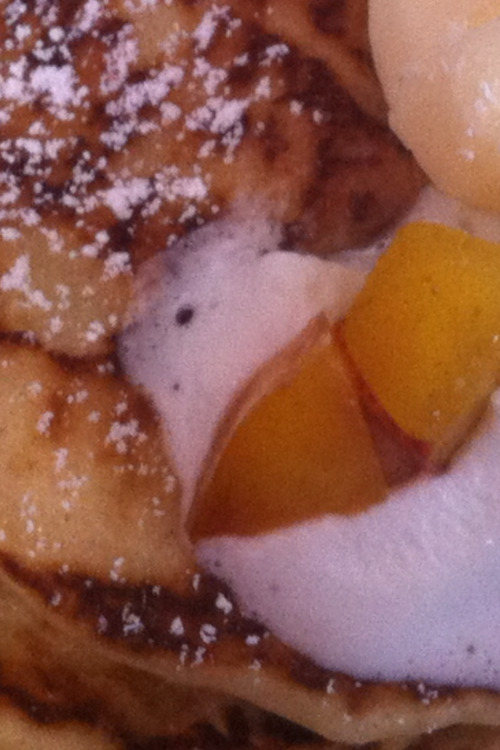 Rather, the peaches adorned the pancakes in small, non-skinned chunks. This culinary stratagem preserved the peaches’ freshness and juiciness and energized the platter’s presentation. Although I chose to wash this meal down with a freshly brewed iced tea, feel free to bring liberal quantities of alcohol to Queens Comfort. It is B.Y.O.B. 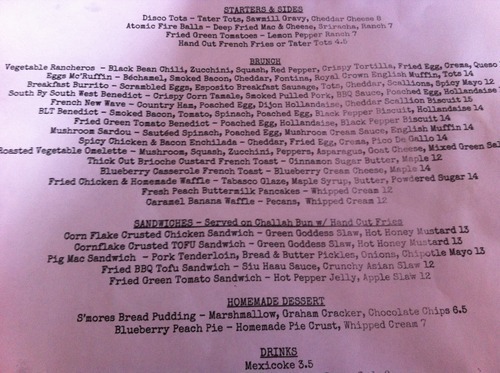 – the brunch acronym that sounds better to New Yorkers than the heraldic trumpets of the angels. This week, we’re talking cream cheese pancakes. But don’t worry, these are actually the opposite of decadent. 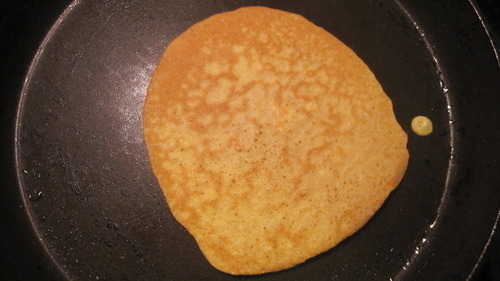 When I started reading this recipe, it looked like it was being touted pretty hard as a low-carb gluten-free pancake. 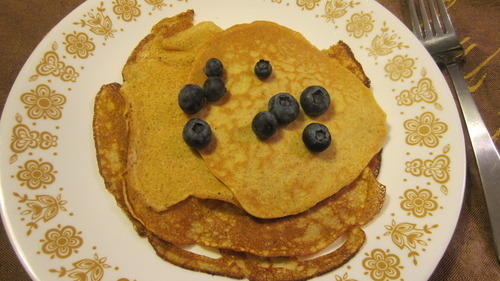 Now, I’m not particularly interested in low-carb or gluten-free (this is a pancake blog after all), but I thought the recipe sounded interesting and it couldn’t hurt to have a solid low-carb gluten-free recipe on hand, just in case. Reality is, though, the carbs are the most important part of a pancake!! They’re what keep pancakes from being weird omelettes. In any case, these tasted alright. 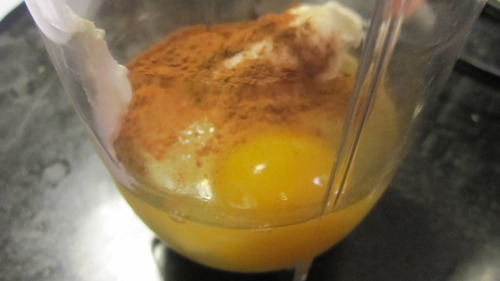 They were super cinnamon-y and reminiscent of a cinnamon cheesecake, so far so good, right? My problem was really with the texture. They were kind of spongey (from the cream cheese), very soggy, and ripped easily. Honestly, they kind of tasted like crepes…of failure. failure crepes. And that’s not really what I want to eat in the morning. Final verdict? I guess if for medical reasons, you have to eat low-carb and gluten-free, these would tide you over, but I’m sure there’s a better recipe out there. Oh, what’s that you say? You don’t have an encyclopedic knowledge of food-related Katy Perry lyrics? Don’t worry, we got you. Even though these pancakes have lots of veggies in them, they definitely err on the side of hearty and filling, rather than healthy and light. I ended up just eating a whole bunch of pancakes for my entire meal (I know…my life is so hard) and even though my belly was pretty happy, I felt like I had to eat straight-up salad for the next few days to compensate. I will also put it on the record, that I had a bit of difficulty cooking these pancakes. 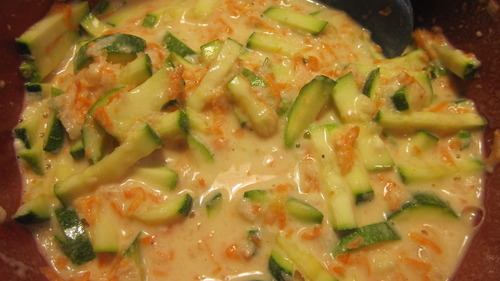 There was just too much liquid in the batter from the zucchini, onion, and carrots; my pancakes came out runny and a little soggy. I’m pretty sure I’ve fixed the problem in my recipe, but just be aware, if your batter looks runny, just go ahead and add a bit more flour. 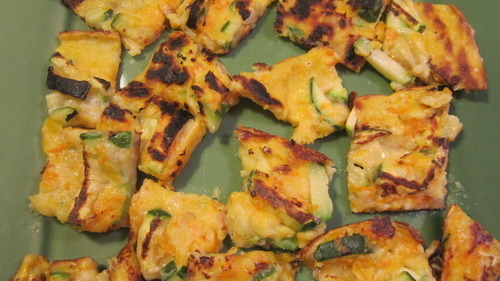 These pancakes were decent, but as far as zucchini goes, I prefer the Turkish Mucver from last summer. Everyone remembers this Jack Johnson song, right? I’m pretty sure that’s a “yes” since almost every time I tell someone about this blog, they ask whether I’ve made banana pancakes and guess what? 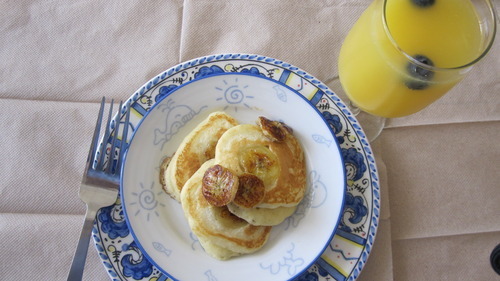 Until today, I hadn’t really made straight-up banana pancakes. Sure, I’ve posted other recipes with a mashed banana or two in the batter, these are the real mccoy. 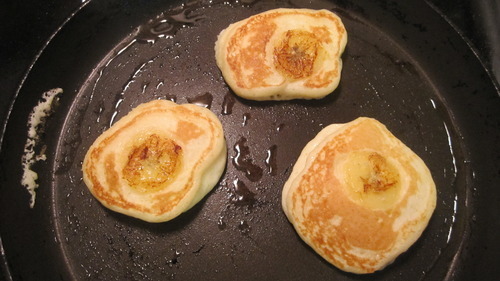 Little silver dollar pancakes with a perfect banana slice per pancake. The pancakes are pretty fun to make. Somehow, cooking mini things is always more fun than cooking the regular-size version. The pancakes also cook quickly so you can make big batch pretty quickly. Just watch out for the banana stickiness – my spatula get getting stuck to the pancakes. 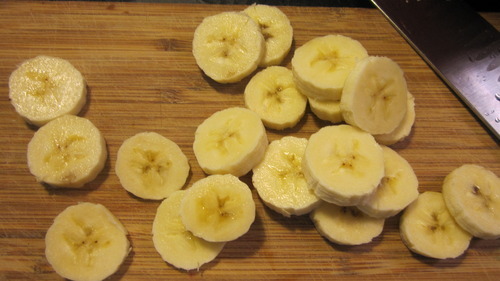 I had a few leftover banana slices that I just sauteed quickly in the pan. I thought those sauteed slices along with the pancakes were tasty enough, but I bet these pancakes would be equally delicious with some warm syrup or honey. It’s hard to go wrong with a classic and these pancakes are no exception. I’ve done it! 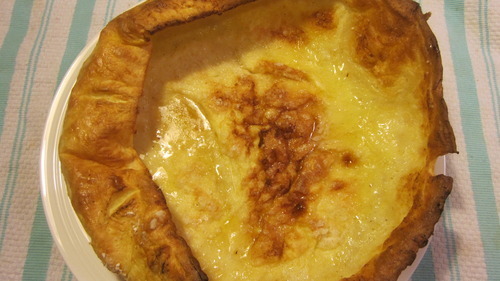 I’ve finally mastered a baked pan pancake with this classic Dutch Baby. I really have to give all of the credit to the recipe which is David Eyre‘s famous New York Times recipe.You can also look at my version which is just scaled down for a 9” pan (instead of a 12”). The pancake puffs up beautifully in the oven, gets a nice golden crisp, and is perfectly flavored with the powdered sugar and lemon juice. You can try the pancake with some jam, jelly, or fresh fruit, but I think it’s delicious just as it is. 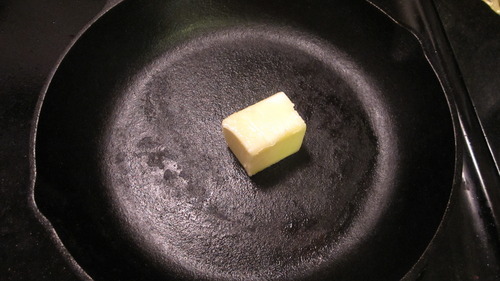 The pancake also uses an astonishing amount of butter per pancake, but hey, deliciousness has its price, right? 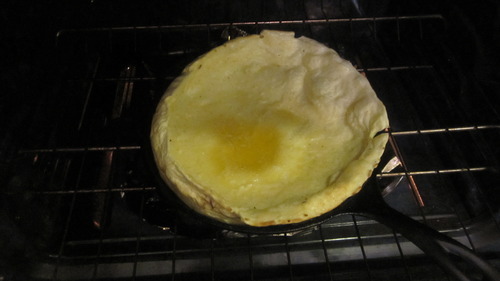 My usual problem with one pan baked pancakes is that there are always pockets of flour that are unincorporated but somehow, it just doesn’t happen with this recipe. Plus, I tried the recipe with sifted and unsifted flour and it came out great both times. Glory. Pure one-pan glory. 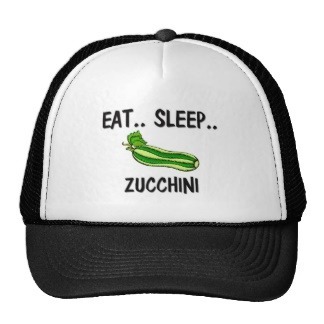 Go stuff your face.